New technology was introduced at the Technology World forum in London last week which washing machine manufacturers will see as a huge threat to their business. 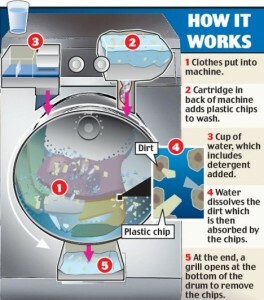 This new washing machine from Xeros Ltd does not use even a single drop of water! Infact it washes clothes using beats to completely and effectively clean clothes with any need of water! The washer that was introduced last year picked up a lot of attention. The company got strong support and interest from countries such as the Middle East and China where water is scarce. Xeros says washing with the Xeros washer is simple, put in your stained clothes inside the washer which feeds the load with their beeds. It uses less than 10% of water to wash and dry the clothes. The company would not reveal what the beads are made of and says that it was offered a huge amount of money by washing machine manufacturers who wanted to buy the patent and shelf it so this technology could not be brought out. Free WiFi from Vending Machines in Japan!